Use this link to receive a discount on your purchase of Gevalia Cold Brew Concentrate! For those of y’all that aren’t already aware, I started nursing school 3 weeks ago! Three weeks ago today, I said goodbye to my social life, actual sleep (you know, the one where you wake up feeling rested) and any opportunities I had of enjoying a hot meal in the morning (to be honest, this luxury was already slipping through my college student fingers). I know, I know…I probably sound uber dramatic sitting here, making nursing school sound like some huge, scary, time consuming beast….and that’s because it is. No kid. These bags under my eyes could carry a week’s worth of groceries. With such limited time on my hands these days, I’ve had to get really creative with my meals, especially in the morning. Gone are the days when I could just drive to my local coffee shop and wait in line to be served (aaaah the horror of even thinking about it!). Last week, I was at Walmart getting all of my goods for meal prepping, when I found a game-changer down the coffee aisle. There just so happened to be a new product out called Gevalia Cold Brew Concentrate that was just sitting pretty on those shelves. A 32 oz bottle of iced coffee concentrate that doesn’t need to be refrigerated, is totally customizable and serves up 8 deliciously caffeinated servings for only $5.90? I was SOLD. Into my cart it went, ready for the endless coffee combinations that I already had brewing in my mind (see what I did there?). Since I figured this would probably serve as my morning pick-me- up and breakfast all in one, I decided to use the Cold Brew Concentrate to make a Chocolate Mocha Almond Protein Smoothie. 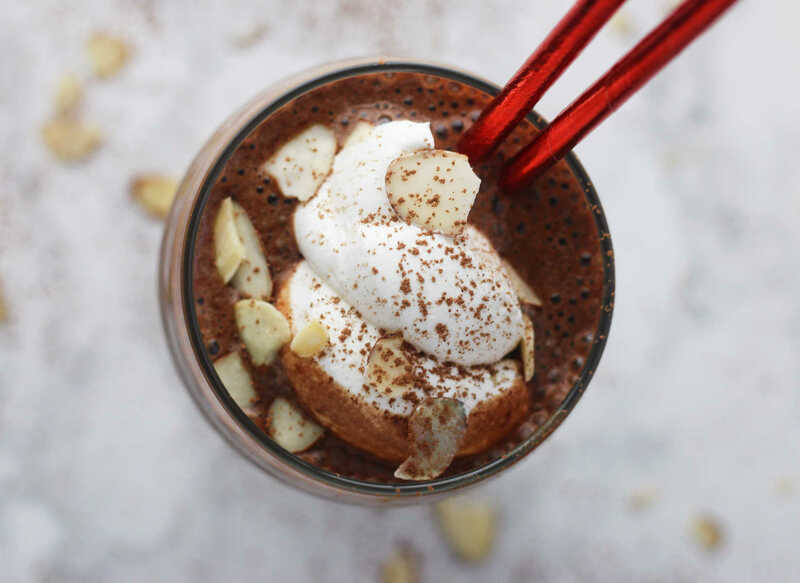 The rich coffee flavor in addition to the chocolate protein powder and frozen banana made this smoothie the type of creamy that makes you feel like Monday mornings aren’t actually that bad after all. A few sips in and I was beginning to feel u-n- s-t- o-p- p-a- b-l- e. Nursing school…BRING IT. Deliciously creamy protein-packed smoothie made with cold brew concentrate. The perfect morning pick me up! Add all of the ingredients, except for the sliced almonds and lite whipped topping into a blender and blend until thick and creamy. Pour into a tall glass and top with lite whipped topping and sliced almonds. Optional step: for a pretty drizzle effect, combine 1 tsp sugar free maple syrup and ½ tsp cocoa powder. Drizzle into the glass before pouring the smoothie. Use this link to receive a special discount on your purchase of Gevalia Cold Brew Concentrate! Yay for nursing school! I'll be done in December and I'm SOOOOO ready :) My best advice to you - get yourself NCLEX review books NOW. Every semester get new ones that correlate with the course work and practice practice practice how to answer those questions. Time will absolutely fly and you will be done before you know it! And my staple breakfasts - overnight oats (I make 15-20 packets in ziplocks that I just need to add almond milk to) and yogurt bowls with fruit, granola, nut butter. Good luck!!!! !